This isn't one of the "official" cows but is nonetheless striking in its appearance. The Stockmans Corner cow is a reminder of the old days, when cows were allowed to roam free through the streets. This behaviour was outlawed in 1955 when the cows started lurking atop the building rooftops, scanning the streets for their arch-nemeses, the sheep. In the paranoia that followed, many owners of woolly cardigans were crushed to death by cows which had leapt from tall buildings in order to give their lives to the cause. 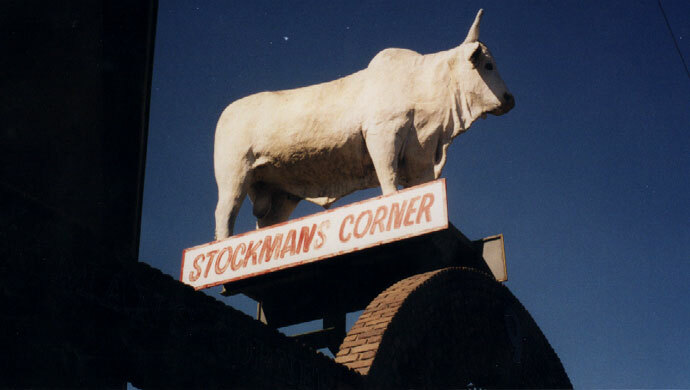 The symbolism of the Stockmans Corner cow conveys a simple message: Eat more beef.